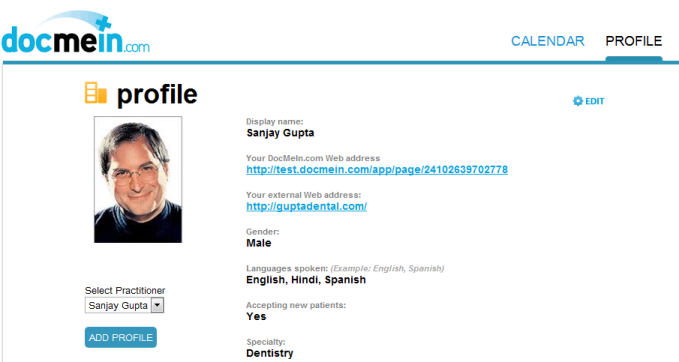 One of the major recent additions to DocMeIn.com was the ability to enroll multiple practicing physicians in a single practice account. To access the new feature, simply open the profile tab and click add profile. Each practitioner has a separate public profile page and a separate calendar, which can be managed through the same practice account. To select which calendar to manage, use the practitioner drop-down selection box above the calendar on the calendar tab. Group practice accounts continue our tradition of offering a completely free and unlimited use service, no matter how many practicing physicians you have in your practice. There are no limits on the number of doctors, patients, appointments, reminders — or anything else you may have in your account. It is our pledge to you that our existing functionality will remain free to you forever, so grab your account now if you haven’t already!